Herbal antihistamine and decongestant. Sinus help for hayfever, allergies, itching eyes and sinus infections. Helps dilate bronchials and shrink swollen tissues. Use any time of day when you need seasonal relief, under the weather. Contains notes of Citrus, Eucalyptus and Tea Tree. Powerful, popular Allergy expectorant from Jeanne Burgess to break-up and clear respiratory congestion in the sinuses and lungs. Immediately creates an uplifting, fragrant atmosphere. 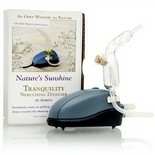 Ionizes essential oils enhancing their biological effects. From Nature's Sunshine - Powerful, popular Allergy expectorant to break-up and clear respiratory congestion in the sinuses and lungs. Provides antioxidant strength to maintain stable mast cells and supports the body's efforts to maintain normal mucous membranes, keeping nasal passages open. The combined effect is to open, loosen, and stimulate gentle removal of mucus. It activates body (loosens phlegm) while calming nerves (reducing urge to cough) and building immunity (to prevent respiratory infections). Four herbs to open, clear and relax the lungs.